0.78 inch OLED Touch Screen Bigger screen, fit the width of the wrist, bring pleasant feeling of wearing. Big screen display a comprehensive and rich information, raise the wrist, efficiency is obvious. Feature With 5ATM Water Resistant Rating One of the things that set the Mi Band 3 apart from many other feature-laden smartwatches available is its 5ATM water resistant rating - withstands pressures equivalent to a depth of 50 meters, making it a charm when being exposed in rain, splashing, accidental submersion, showering, surface, swimming. Sports Details Function In the sports modes of the Mifit APP, if you turn on one of the sports modes of treadmill,outdoor running, riding or fast walking, just lift your wrist and check the length, mileage, heart rate, speed and other data on your bracelet. Notification Display & Reject Phone Calls While Bluetooth connecting, if there is an incoming call, it would show the caller ID. Almost notification of APPs could be synchronized to the watch. 3 Pages Message Display Support to check the latest 5 messages, If each text of message exceeds the display, touch the button can display in next page. (up to 3 pages can be displayed). Raise Wrist To Wake Up The Screen Raise your hand to brighten the screen without taping screen to see real-time states including sports data, time and heart rate. 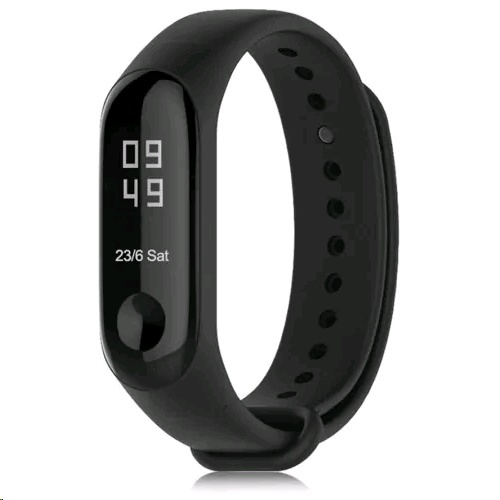 Pedometer / Sleep Monitoring / Sedentary Reminder Mi Band 3 helps you record all your activities in the day,calculate the distance you walk and calories burned,take care of your health, monitor your sleep, remind you to have a rest and track your steps, mileage and calories for high quality sports. 24 Hours Heart Rate Monitor It tracks your heart rate continously at every moment every day. Heart rate recording will start automatically once you wear it on. Long standby time Xiaomi mi band 3 with ensures about 20 days ultra-long standby time for a full charging.